It takes brass to tackle Mistero Buffo. Dario Fo’s twisted mystery play was a showcase for the late great man himself, as celebrated for the performance as for the script. To take it on says a lot about an actor’s estimation of their own ability. Good thing, then, that Rhum and Clay’s co-artistic director Julian Spooner has that ability beyond measure. 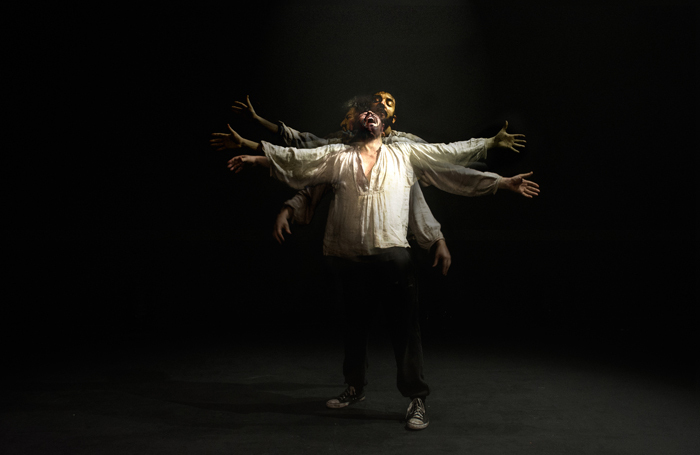 Where Fo’s approach was a kind of resurrection of medieval jesters, or giullari, Spooner and director Nicholas Pitt bring Buffo bang up to date. He’s a zero-hours Deliveroo worker, taking Jesus Christ and other JCs to task; thumbing his nose at the hypocrisies and absurdities of Christianity, at the uncaring nature of all forms of authority. Spooner’s restless jongleur keeps telling us about miracles, like the wedding feast at Cena, but it’s the performance that’s miraculous. He puts every second of his Lecoq training into it, and the result is astounding. There’s a stunning scene where he creates an entire crowd at the over-commercialised resurrection of Lazarus, jumping between spots on the stage, moving like a rocket. Although this is really just an actor doing a monologue, it never feels like that. It’s much more alive than that sounds, far more spontaneous. Spooner apes stand-up comedians: he repeats laboured punchlines in increasingly silly voices, he goes full Lee Evans in his sweaty sprints between all four corners of the stage. Moments of rage are in there, too: he’s a woman shouting at god for the slaughter of her son by Herod’s cronies. Was it worth it in return for the son of god? In summary: magnificent.